Ever since Marvel’s “All-New, All-Different” universe began, tensions between the Inhumans and Mutants of the Marvelverse have been high. Scott Summers supposedly died doing something to majorly tick the Inhumans off. Terrigen mists are sterilizing and poisoning mutants. And now, those tensions are boiling over. 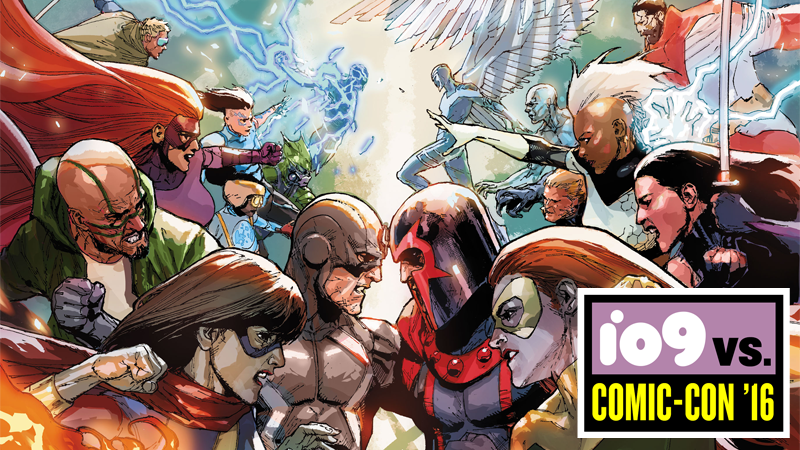 Announced at today’s “Cup O’Joe” panel with Joe Quesada at San Diego Comic-Con, Inhumans vs. X-Men will be a six-part miniseries by Jeff Lemire and Charles Soule, with art by Leinil Yu. The story will see the current situation with the Terrigen mists reach its climax, as the mists—the biological gas that contact with triggers latent Inhuman genes in humans, beginning their transformation into Inhumans, vital to the continuation of the Inhuman race and responsible for the current rise of prominence in the Inhuman population—achieving complete global saturation in the Earth’s atmosphere. The problem? Out of nowhere, the Terrigen mists have also been poisoning mutants all over the world, infecting them with a lethal disease and sterilizing mutants lucky enough to not come fully into contact with it. So with the threat of Mutant annihilation at hand (again), all corners of Mutant-kind are forced to band together to stop the mists once and for all. The Inhumans won’t really let that happen—after all, the mists are vital to their own existence. So they gather everyone they can, from the stars of Uncanny Humans to heroes like Ms. Marvel or Moon Girl, and get ready for the fight of their lives. Who will win, who will survive? We don’t know yet, obviously, but this is a conflict that’s been simmering in Marvel’s books for a while at this point. It’ll be exciting to see it finally play out. Inhumans vs. X-Men will begin this Winter.